We continue covering the list of Top 20 CS:GO Esports players of 2018. In the previous part, we covered sunNy, EliGE, oskar, Xyp9x, Twistzz, and GuardiaN. In this part, we are going to talk about players from 10th to 6th place. Coldzera is definitely one of the best players in CS:GO history. He started playing CS:GO in 2013, when he played for SemXorax. The next year, he won three Minors with Dexterity Team, Baxissimo Nivel, and Golden Glory. The following year was the year of breakthrough for a Brazilian player. He began 2015 with Dexterity and after several titles and good results, he later moved to Luminosity Gaming. The rest of the year was good for coldzera, but he lacked titles. 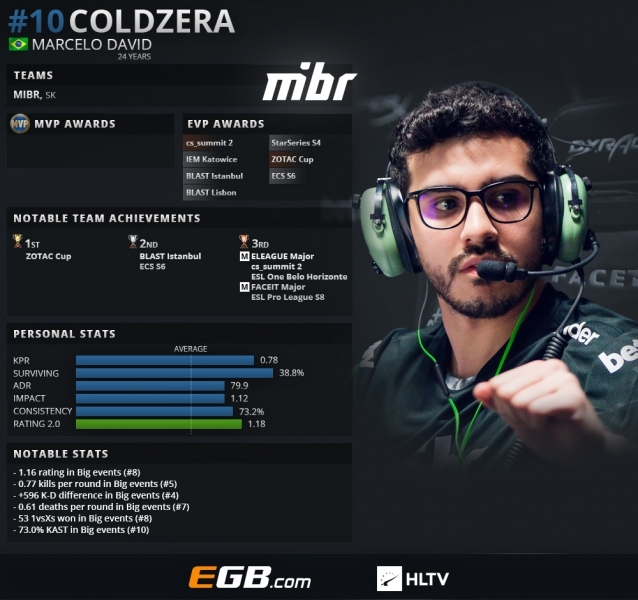 However, MiBR’s player should be satisfied with what he achieved with his team in the first half of 2016 as they won two Premiers, one Major and one Minor as well as about $950,000 US Dollars. Afterward, coldzera joined SK Gaming. He had so much success with that team, especially in 2017. That year, SK Gaming was perhaps the best team in the world. They won many big titles such as ECS Season 3, ESL One: Cologne, EPICENTER 2017, ESL Pro League Season 6, and so on. Brazilian team earned over one million dollars that year. 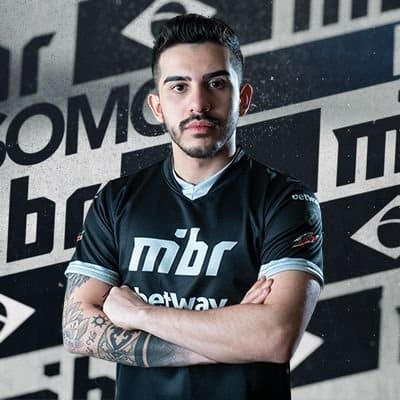 Last year was very turbulent for both SK Gaming and coldzera, considering they all started playing under MiBR’s name. Also, they couldn’t be happy about the first half of the season given that they performed pretty poorly. Coldzera was actually named best player in the world two years in a row before 2018. Alongside his great showings, team results were the thing that helped him to be considered as the best CS:GO player in the world. This year, he should thank his consistency as one of the crucial reasons for him being a 10th player on the list of Top 20 CS:GO Esports players of 2018. Coldzera had a rating above 1 at all events except ELEAGUE Premier 2018. He performed great at ZOTAC Cup Masters (1.44), DreamHack Masters Stockholm (1.32), and BLAST Pro Lisbon (1.31). The Brazilian won seven EVP awards, five at big events. He is very good when it comes to closing the round considering his 53 1vX duels won(8th in the category). Also, he has 10th best KAST percentage(73%), followed by fifth-most kills per round(0.77), and seventh least deaths per round(0.61). He is eight best-rated player at Big events with rating 1.16. However, the reason why coldzera is not placed higher on the list of Top 20 CS:GO Esports players is because he is performing significantly worse in the Play-offs than in the Group Stage. Also, he lacks team results, and that’s why he couldn’t get any higher here. KRIMZ has a long and quite a rich career. He turned pro in 2013 when he started playing for LGB eSports. The Swedish player won two Minors that year and one more next year with the Norwegian team. In July 2014, KRIMZ moved to his current team, and stayed there up to today, excluding one short period he spent in GODSENT in 2016. Therefore, KRIMZ’s path follows Fnatic’s results from the middle of 2014. KRIMZ won an unbelievable number of 17 Premier titles, many Major tournaments, and countless Minors, Qualifiers and Weekly events. He earned about $700,000 only from prize money. Of course, the vast majority of that comes from a time when he has been playing for Fnatic. Last year, he won three titles with the Swedish team, and two of them were WESG 2017 and IEM XII World Championship. Fnatic earned $1,050,000 only from these two events. After being part of Top 20 CS:GO Esports Players in 2014 and 2015, KRIMZ was absent from these lists in 2016 and 2017. Now, he managed to take place in the list of Top 20 CS:GO Esports Players of 2018. 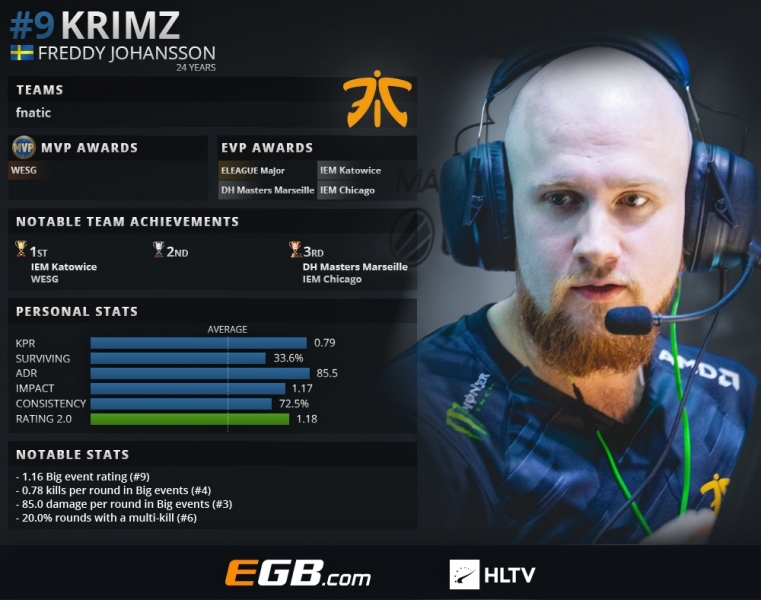 KRIMZ should be thankful for the start of the year when he was 9th place on list of Top CS:GO Esports players. Undoubtedly, that was the period when KRIMZ and whole Fnatic squad played the best. However, Swedish player wasn’t bad in the rest of the year neither. He had a ninth-best rating at Big events (1.16). He surely was one of the most aggressive players of 2018 considering his 0.78 kills per round, 85 damage per round and 20% round with multi-kill. In addition to that, KRIMZ won the MVP award at WESG 2017 and four EVP awards. Nevertheless, it seems like KRIMZ has the same problem as coldzera as he plays notably worse in the Play-offs than in the Group Stage. It can be caused by many things including pressure, lack of skills against strong opponents, etc. That’s why he is “only” ninth player on the list of Top 20 CS:GO Esports players of 2018. Although gla1ve is a relatively young player (23) his career already lasts for more than nine years. 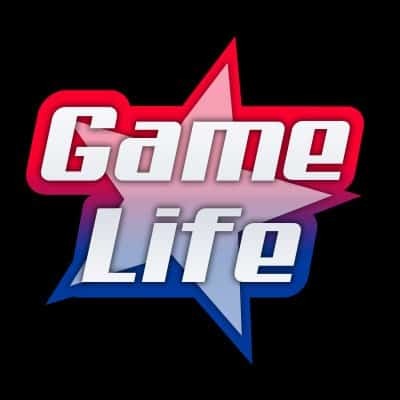 Unlike most of the professional Counter-Strike players, gla1ve started playing CS: Source instead of CS 1.6. From 2010 to 2012. The Danish player changed a lot of teams and won six Minors. He mostly played for Reason Gaming and Copenhagen Wolves. Gla1ve kicked off 2013 in Anexis eSports‘ jersey and then moved to Western Wolves. Astralis’ player finished the season as part of N!faculty. 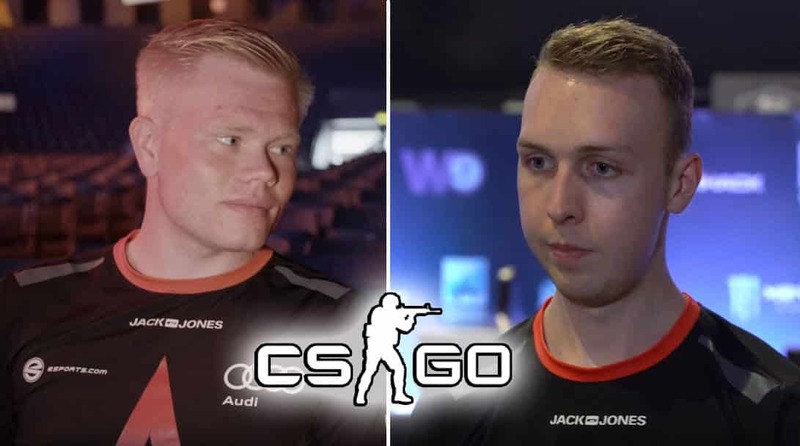 Gla1ve spent the first several months of 2014 in 3DMAX and then rejoined Copenhagen Wolves. Next year was pretty bad for young Astralis’ In-game leader. His episodes in CPLAY and Unu.AiN wasn’t successful at all. 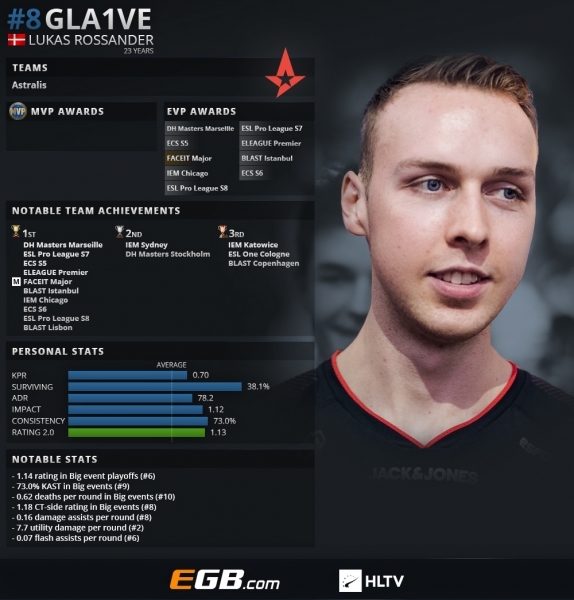 The following year turned out to be crucial for gla1ve. He spent the first half of 2016 in Copenhagen Wolves and then got a chance to be a stand-in for SK Gaming at DreamHack Open Summer. After that, he also was a stand-in for Astralis at ESL One Cologne. Then, he played for Team X and Heroic for short time and finally joined Astralis. So, gla1ve really had to fight his way to top Tier. But it was definitely worth it. The rest of his career follows Astralis’ glorious and historical path of success. He literally won everything he could there, especially last year. Gla1ve was playing constantly good throughout the whole year, excluding only the first event of the year – ELEAGUE Major. His tournament rating never dropped below 1.05 except at already mentioned Major and BLAST Pro Copenhagen. He had high peaks but never won MVP award even though he was very close on several occasions. He finished in Top 5 of MVP races five times, including second place at DreamHack Marseille and ECS Season 6, as well as another two third places. Also, unlike previous players, gla1ve doesn’t have a problem with his level dropping in the Play-offs. On the contrary, he has the sixth-best rating in Play-offs(1.14). Astralis’ player has 73% of KAST (ninth-best), and 0.62 deaths per round, which shows us his ability to survive. Gla1ve is also one the best players when it comes to using utility. His numbers speak for themselves. With 7.7 utility damage and 0.07 flash damage, he is near the best. One of the reasons why young Dane is not placed higher on the list of Top 20 CS:GO Esports players of 2018 could be lack of MVP awards and higher peaks. Also, there are players who simply performed better than gla1ve in 2018. Here is another player from the best CS:GO team in the world. His transfer from OpTic to Astralis is considered to be the best roster change in the history of CS:GO. This young player started playing CS:GO professionally in 2015 for StfuNerd where he had a lot of success at Weekly tournaments. Then, he joined SK Gaming after a short time spent in MTw. Magisk didn’t have so much success in Brazilian team considering they won only one tournament since Danish player joined them. Magisk continued his career in Team Dignitas in August 2016. It was a quite successful period for him. Dignitas won a couple of titles and among them was the title from EPICENTER 2016. Magisk still couldn’t settle down, so he began 2017 as North’s member. The closest North got to the title was at ESL Pro League Finals when they played final but lost to G2 Esports. Magisk’s next stop was OpTic Gaming. Magisk had decent team results there but still didn’t lift any trophy. The most popular change happened in February 2018, when he started playing for his current team. 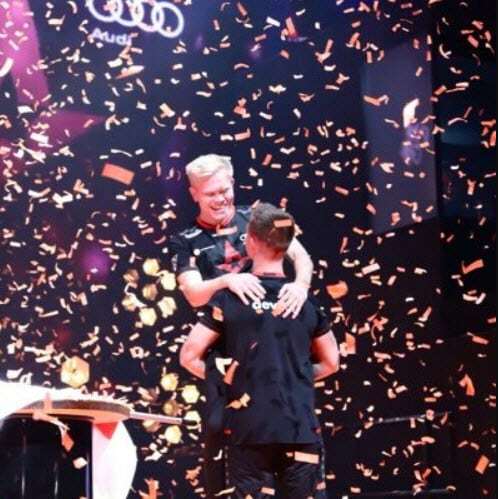 The rest is history – 10 titles, Intel Grand Slam, and almost $4,000,000 won by Magisk and company in 2018. Magisk already was part of the Top 20 CS:GO players of the year in 2016. This year, he owes his seventh place to his consistency during the whole year, as well as match-to-match and round-to-round consistency. Magisk didn’t have performance rated under 1.09 anywhere. On contrary, he had pretty high good ratings at many tournaments, resulting in getting nine EVP mentions and one MVP award at the end of the year at BLAST Pro Lisbon. He has the second-best KAST percentage (74.5%) and seventh-best rating in Big tournaments Play-offs (1.14). As a proof for Magisk’s incredible consistency from match to match, we have his percentage of maps with a rating above 1.00 (74.4%). 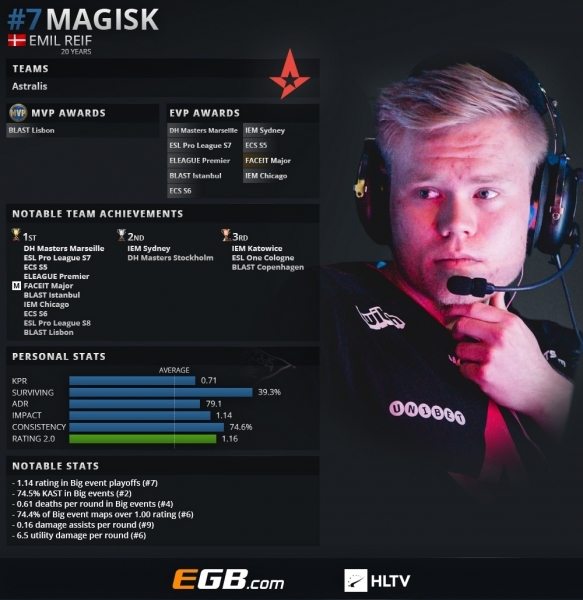 Plus, Magisk also knows how to use his utility as best as possible, as he delivers 6.5 utility damage per round. Without a doubt, utility usage is something that Astralis does the best among all CS:GO teams. The reason why Magisk is not placed higher on the list of Top 20 CS:GO Esports players of 2018 is that he didn’t have enough high peaks. Simply, he was always solid, but rarely was standing out of the competition. This is the first time for NAF being the part of Top 20 CS:GO Esports players. This young player turned pro in 2013. NAF mostly spent next year playing for Denial eSports. The best result from that period surely was a title at John Wick Invitational. Afterward, NAF continued his career in his current team, Team Liquid. He didn’t stay there for too long, so he moved to Luminosity Gaming in March 2015. His next stop was North American team Conquest where he won RGN Freedom Cup. NAF stepped in 2016 with a title for OpTic Gaming. The biggest achievement from his episode in OpTic Gaming was a trophy from ELEAGUE Season 2. Results in 2017 weren’t so satisfactory for NAF and OpTic, so he moved to Australian Renegades in September of the same year. 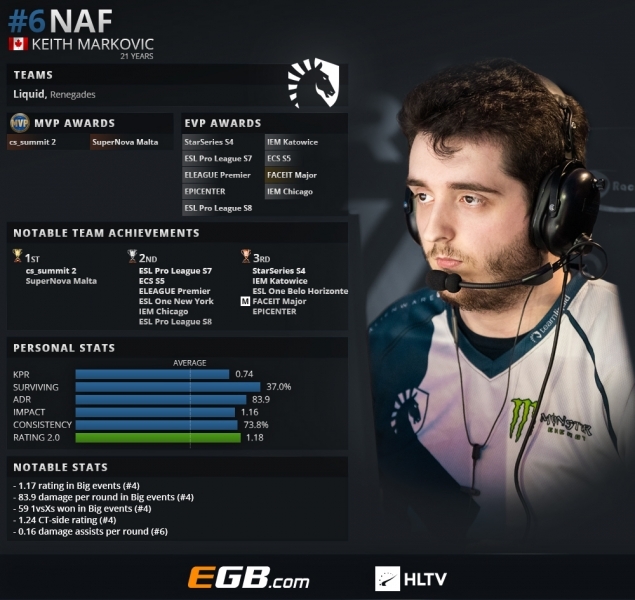 Finally, NAF rejoined Team Liquid before cs_summit 2, the tournament that Team Liquid won. In the rest of the year, Team Liquid was almost always close to the title but didn’t succeed in winning any Big event. Most times, they hit a wall called Astralis. Nevertheless, NA team managed to win one more title at the end of the year at SuperNova Malta 2018. NAF can be particularly proud of his two MVP awards at only two tournaments that Team Liquid won, as well as of nine EVP awards. He took fourth place in categories of rating in Big events (1.17), damage per round (83.9), clutches 1vsX (59), and CT side rating (1.24). However, NAF is very useful for the team in terms of assist damage as well. He dealt 0.16 damage per round, which puts him in sixth place in that category. NAF also knows how to use the utility in a good way, considering he dealt 6 utility damage per round. In addition to that NAF had 1.12 playoff rating. His only bad tournament was ECS Season 6 Finals where his rating was estimated at 0.90. Regardless, NAF couldn’t get any higher on the list of Top 20 CS:GO Esports players of 2018 because of a couple of reasons. First of all, players above him on this list were more consistent. Plus, NAF was performing pretty bad in title decider matches, especially against Astralis. If we look for a reason for Team Liquid’s lack of title, NAF could be one of those, but also he is the most deserving player for only two titles that Team Liquid won.